Shay Given has enjoyed his time with the Rams so far. Derby County goalkeeping coach Shay Given says there’s a real feel good factor around Pride Park following the Rams’ bright start to the campaign. Four wins in a row going into the international break have seen Derby break into the top four early on and they will go to Rotherham United this weekend favourites to extend that run. And Given has been thrilled with how things have gone since he came to the clb in the summer to join up with new boss Frank Lampard and his coaching staff. He told RamsTV: “It’s gone really well. Obviously we’d have liked to have won every game but to be two points off the top is a good start and there’s a feel good factor about the place which you want all season. After a long playing career that saw him make over 600 professional appearances, Given says having a watching brief from the bench is an entirely new experience to get used to. He said: “When you’re playing you feel more in control of a situation but on the bench you’re a bit more jittery and anxious and just willing the players to get the result, and when they do it’s amazing and if not it can be a real low, more so than as a player in some ways. 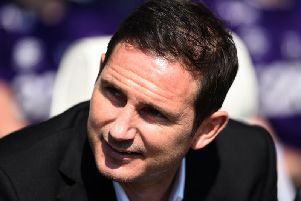 With Given starting out as a coach he says he’s enjoyed working alongside the likes of Frank Lampard and Jody Morris as they all learn the ropes at Pride Park. He said: “I like to learn from them, not just on a goalkeeping level but coaching in general so I hope to become a better coach overall. Given says having the quality of goalkeepers the Rams possess has helped his cause. “Scott Carson has been brilliant since I walked through the door. He’s very professional and experienced and his consistency levels have been superb. He wants to improve all the time which is what makes a top goalkeeper,” said Given. “He’s been comfortable with the ball at his feet which helps with the way we play and even though he’s had a long career already, I know from experience that every little thing can be improved one way or another. “For Kelle Roos it’s difficult as he wants to play and it was nice that he played well at Hull in the Carabao Cup, but he’s ready to step in if anything happens to Scott and the Hull game gave him a good lift.